“Cowards die many times before their deaths. ebook is now live on iTunes and inkling habitat! Now Available on iTunes and iBookstore for Apple Macintosh and iPad. Don’t have a Mac or an iPad? Download from inkling habitat. In Kneed of Repair provides an easy way to understand the anatomy of the human knee though beautiful illustrations done by the author, himself. Beyond providing an understanding of how one might sustain a serious injury and the different medical choices that accompany recovery, Dr. Oyolu recounts his own injury and addresses the very human thoughts and emotions that he, himself, struggled with. The book provides reassurance where concerns may arise and encourages readers to dedicate themselves to the demanding task of rehabilitation. It goes the extra mile in explaining different stretches/exercises for physical therapy and cataloging things to prep for the long journey to recovery. The ebook also includes embedded videos if you have trouble visualizing the exercises explained in writing. All in all, In Kneed of Repair was an easy read that I enjoyed thoroughly. It’s a great tool if you or someone you know has seriously injured their ACL and don’t know exactly where to begin.. Start by having a look at this book! 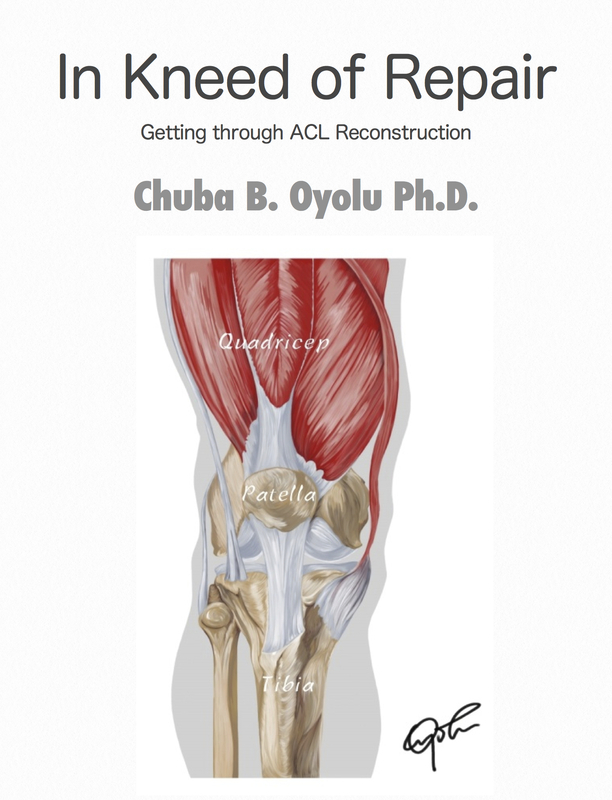 This book explains the process of having an acl repaired from start to finish and beyond. I especially enjoyed the illustrations. The videos and detailed exercises will be a great reference during my own recovery. Well done!